It’s Friday and, for a lot of us, it’s payday as well, but there’s another reason to celebrate 29 March, too. 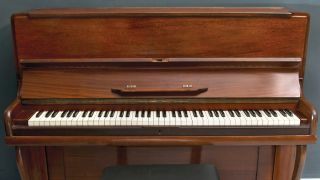 This being the 88th day of the year, it’s also Piano Day 2019 (we’ll let you join the dots), which means that, for 24 hours, synthetic ivory tinklers and their instrument of choice are in the spotlight. Events to mark the occasion are taking place all around the world; you can find out what’s happening near you (and not so near you) on the Piano Day website. The day is the brainchild of German musician Nils Frahm - who, perhaps not coincidentally, launched a new Kontakt piano instrument with Native Instruments earlier this week - and he’ll be playing in New York this evening. Other notable events include a 12-hour Pianothon at the Shoreditch Treehouse, and performances by Rival Consoles and Midori Hirano at the Erased Tapes Sound Gallery in East London. Of course, there’s a good chance you might not be able to make it along to an official Piano Day event, but you can still have some keys-related fun. Perhaps the best thing you can so is simply to sit down and play - whether that be on a real piano, a digital model or via a MIDI keyboard. Alternatively, how about a round-up of the 6 best piano learning apps?